Pro Kabaddi 2016 Season 4: After the successful Pro Kabaddi Season 3, The PKL season 4 is all set to entertain the Kabaddi fans in the same year 2016. The Pro Kabaddi League 2016 Season 4 is slated to start on 25th June 2016, and will go on 31 July 2016 which will entirely be held in different indoor stadia across India. Overall, the format of the tournament remains similar to that of its earlier editions. Each team will play 14 matches in the group stages at the end of which the top four teams will surge ahead to the semi-finals on the basis of their points scored till then. To increase the viewership the organizers have decided to telecast The Pro Kabaddi League (PKL) Season 4 in different regional languages. Check out The Pro Kabaddi League Season 4 Schedule / Fixtures, Teams and Players, Live Streaming, Live Scores and more info from below the article. Here is the Pro Kabaddi League (PKL) 2016 Season 4 Team Squads. Here is the full list of Schedule, Fixtures, Time Table of Pro Kabaddi League (PKL) Season 4 2016. Here is the full list of channels telecasting the live streaming of Pro Kabaddi League (PKL) Season 4 2016. Regional channels are planning to telecast the Pro Kabaddi Season 4 in their local language. Hotstar App and SportsStar.com will live telecast the Pro Kabaddi League Season 4 2016 Live on Mobiles / Tablets. Season 1 – 2014 – Jaipur Pink Panthers. Season 2 – 2015 – U mumba. Season 3 – 2016 – Patna Pirates. 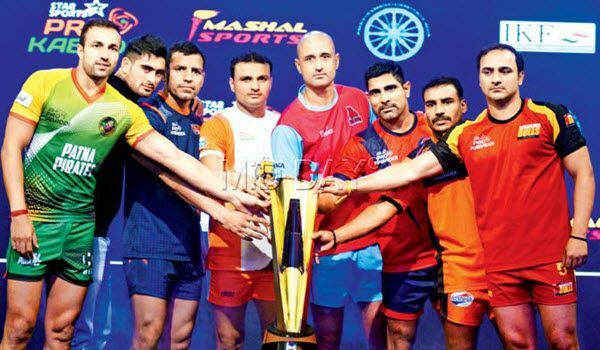 Hope you like this Pro Kabaddi League 2016 Season 4, Schedule, Fixtures, Teams and Live Streaming Info. If you like this then please share it to your friends.